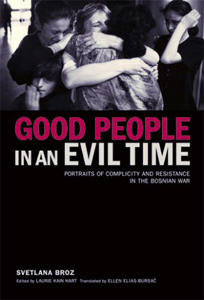 The stories of generous people who reached out across ethnic conflict and violence to help others are revealed in Good People in an Evil Time: Portraits of Complicity and Resistance in the Bosnian War. The stories of generous people who reached out across ethnic conflict and violence to help others are revealed in Good People in an Evil Time: Portraits of Complicity and Resistance in the Bosnian War. The testimonies were collected by Svetlana Broz (granddaughter of former Yugoslav Head of State Marshal Tito) and the book was produced in English and edited by Associate Professor of Anthropology Laurie Kain Hart. Included also is a chronology of the conflict in Bosnia written by Associate Professor of History Alexander Kitroeff, and a history of Bosnia written by former Assistant Professor of Religion Amila Buturovic. The book was released by Other Press (New York and London) this month. In the 1990s Broz volunteered as a physician in war-torn Bosnia and heard the stories of her patients' experiences, stories that had been suppressed by the government and the media. During the next several years she collected the testimonies of ordinary citizens who displayed kindness and compassion in the face of such terrible circumstances. Included are the tales of Mile Plakalovic, a taxi driver who picked up the wounded from the sidewalks and delivered food and clothing to the young, and Velimar Milosevic, a poet who traveled with an actor to entertain children, all the while hiding in basements to avoid bombings and gunfire. “The testimonies are complex, moving, and enlighteningâ€”there is no simple story here,” says Hart. Hart became involved with Good People in an Evil Time through colleagues at Harvard University who were familiar with her research in ethnicity, identity, and conflict in the southern Balkans and of her role as a series editor at Other Press. Hart also wrote an introduction to the book, in which she discusses the importance of bringing these stories to a broad audience.